Things I Think For This And That... This entry is for my recent infatuation with Duelyst, a card collecting battle game crossed with strategy and tactics. Seeing as I am awesome at all of these genres, its no surprise that I have quite an impressive losing streak going. 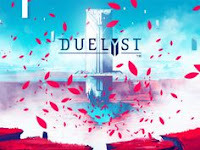 As the title implies, Duelyst is a 1 on 1 battle game. Similar to the recent Blizzard hit, Hearthstone: Heroes of Warcraft, its basic gameplay is that of a collectible card game. What sets it apart is that it also employs a tactics and strategy side. The game board is a grid where you actually place your card minions, heroes, and spells. When choosing cards you must take into account you and your opponent's main player character, the general, and his or her various minions on the game board. The generals start with 25 hit points, once they are drained to zero the game is over and the remaining generals' team is declared the victor. Duelyst is in currently in open beta, and following the free-to-play model supported by micro-transactions. The in-game purchases grant you card packs with the guaranteed rare (or better) cards. This keeps the matchmaking pretty fair and also keeps a pay-to-win perception away from the community. Personally, I am terrible at strategy games and this is certainly no exception. The single player campaign is just there to teach you how to follow the game's rules and basic tactics and techniques. Once you get comfortable, the meat and potates of Duelyst is lies in its online head-to-head multiplayer. Online play is fair, but brutal. Despite losing most matches I am finding the art and music and overall presentation very inviting and addicting. The beautifully drawn landscapes play off of the 16-bit style of the on screen characters and animations. The crescendos of the battle music are punctuated with the sounds of your minions and heroes clashing on the battlefield. Duelyst is different and unique. The core gameplay is frustratingly satisfying and yet harmoniously beautiful. Add me on twitter and google plus. SherrysJoy, with her new-found interest in Hearthstone: Heroes of Warcraft.